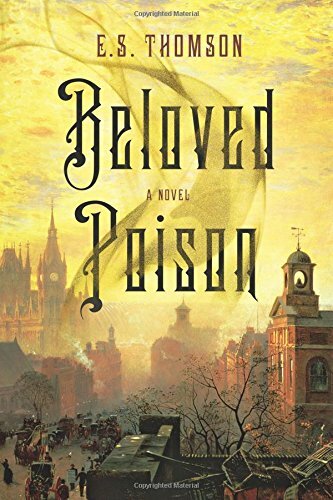 E. S. Thomson’s debut novel, Beloved Poison, introduces a major talent in this gritty historical mystery whose macabre setting sends chills down one’s spine as well as invoking an urge to bathe in a tub of disinfectant, the stronger the better. St. Saviour’s Infirmary has been sold to the railroad interests in 1850s London. A railway bridge will be built in its place, an example of London’s industrial progress, but not everyone is pleased with the plans for demolition. Jem Flockhart, along with her father, is a resident apothecary at St. Saviour’s. The dank, crumbling building with its perpetual damp and the sound of rats scrambling about the wards is the only home Jem has ever known, and she dreads leaving and possibly having her secret discovered. The young architect, William Quartermain, “lacked any degree of urban sophistication” in Jem’s judgement, but Will proves to be kind and in the end, a good and loyal friend. But they are not human infants but instead figures crudely carved from kindling to resemble infants. Both Will and Jem are repulsed by the grotesque “dolls,” but have no idea what they mean other than indicating some sort of ritual. She shows the coffins to Dr. Bain, her best friend among the medical staff, and the only one who insists cleanliness in the operating theatre is the best way to save lives. Dr. Bain mutters something to the effect that “it is starting again,” but says nothing more although it is obvious to Jem that the doctor is uneasy. The disagreements between Dr. Bain and the other doctors over his medical theories add to the tension that infuses the hospital as much as the poisonous air full of coal dust that seeps through the ill-fitting windows. Dr. Graves is particularly dismissive of Bain and envies the regard that Dr. Magorian seems to feel for Bain. Dr. Catchpole also despises Dr. Bain but not as much for his medical theories as for the fact that Mrs. Catchpole is Bain’s lover. In fact, Mrs. Catchpole is so obsessed by Dr. Bain that she believes they will run away together. She follows him to a brothel and creates a scene aided by Mrs. Magorian and other ladies who read Bible verses to the prostitutes. The scene is humorous in a burlesque fashion. Dr. Catchpole tries to force his wife away from the brothel, but she escapes into the dark. When Jem next hears of Mrs. Catchpole she is locked in the local asylum. It is the same asylum where her father visits for treatment for the insomnia that threatens to drive him mad. Jem and Will visit Dr. Bain only to find him dead apparently from drinking bloodroot, a deadly poison. Jem doesn’t believe it. Dr. Bain would never experiment with poisons unless she was there to watch over him. She attends his autopsy, gleefully performed by Dr. Graves, and sees no bloodroot in Bain’s stomach. This isn’t an accidental death or suicide; it is murder. Jem visits Mrs. Catchpole in the asylum and leaves a jar of salve for a cut on the woman’s head. She suspects that Mrs. Catchpole visited Dr. Bain the night he died. Jem wants to know what the woman saw, but Dr. Catchpole and the Bible-quoting biddies interrupt. The next morning Mrs. Catchpole is dead. Jem suspects the woman has been poisoned, and the likely means is the salve Jem gave her. Someone added aconite to the salve, or substituted jars. Next a street boy to whom Dr. Bain entrusted one of the coffins is found in one of the excavations in St. Saviour’s cemetery. Someone is murdering any possible witnesses to Dr. Bain’s murder. Despite Jem’s belief that she can solve the murders and unravel the riddle of the coffins, her adversary is more clever than she expects. Jem is accused of the three murders and is thrown into Newgate Prison to await a fast trial and a faster hanging. As fascinating as the characters and as complex as the plot, author Thomson’s descriptive narrative of St. Saviour’s and the medical practices common to the time, as well as a depiction of Victorian London almost overwhelm the story. Her descriptions of the foul conditions under which the poor struggled are nothing less than visceral. At the same time there is an element of burlesque in the novel. Thomson’s use of names convey an underlying subtext. Mrs. Roseplucker as the pox-ridden madam; Dr. Bain who is the bane of the murder’s existence; Dr. Graves whose patients often end up in early graves; even Dr. Catchpole’s name fits the tall, thin man whose nose sprouts an abundance of hair. Beloved Poison is an absorbing read on many levels, sure to enthrall readers and leave them anxious for her next book.